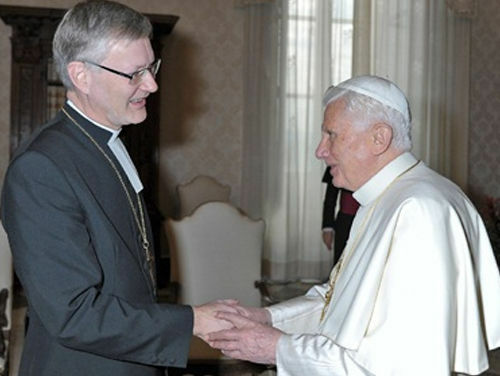 Benedict XVI declares the Lutheran layman Hakkinen a “Bishop.” This is a denial of Catholic teaching on holy orders. The Church has been very clear that Lutherans do not possess valid priests or bishops. Benedict XVI declares that he is in “communion” or united with Protestant “Churches.” He then says that Protestants bear true witness to Jesus Christ and give the world “the message of salvation.” He concludes his heretical address by declaring that Catholics and Lutherans now have a common understanding of the doctrine of justification. He is a total heretic! The Lutheran “Bishop” tells Benedict XVI that he is on a pilgrimage to Rome with the “Catholic” Bishop. The Lutheran layman then says that “we will celebrate a common ecumenical mass.” I’m sure the apostate Benedict XVI thinks this is great. Typical of Benedict XVI, he promotes the condemned heresies of freedom of religion and conscience. One must also ask why Benedict XVI would use the term “Judeo-Christian”? Why wouldn’t he just say Christian Tradition? The answer is that Benedict XVI is an apostate who accepts and embraces Judaism. It’s why, more than once, he has worn a mitre with the Star of David. Benedict XVI states that Christians are searching for full unity among themselves. The Church by definition is one. This means a unity of faith exists and will always exist among members of the Catholic Church. Those outside the Catholic Church are not considered Christians since they are outside the one true Church of Christ. Benedict XVI allows the Anglican “converts” to retain “spiritual, liturgical and pastoral traditions” particular to the non-Catholic Anglican “Church.” This is heresy. The Catholic Church condemns and does not allow people to use Anglican spiritual, liturgical and pastoral “traditions.” But the apostate Benedict XVI does allow this because he is a heretic. Benedict XVI once again talks about how we need the “reestablishment of full unity among all Christians”; and more than once he quotes the words of John 17:21: “they may all be one.” He cites these words of Jesus Christ frequently, but with the meaning that Christ’s prayer for unity has not yet been fulfilled! The Catholic Church teaches that Jesus’ prayer was fulfilled when Christ established the Catholic Church. In his January 6, 1928 encyclical letter on religious unity, Pope Pius XI addressed those who bring forward these words of Our Lord. L’ Osservatore Romano, January 25, 2012, p. 5. L’ Osservatore Romano, January 25, 2012, p. 3. L’ Osservatore Romano, January 25, 2012, p. 6. L’ Osservatore Romano, January 25, 2012, p. 1. L’ Osservatore Romano, February 1, 2012, p. 3.